Beautiful friends, I am so excited to cross another room off my to-do list!! I have been slowly working on our boys’ bathroom since we moved in back in August. It wasn’t awful at all, so I kept pretty much everything except the weird side by side towel bars reflected in the mirror. 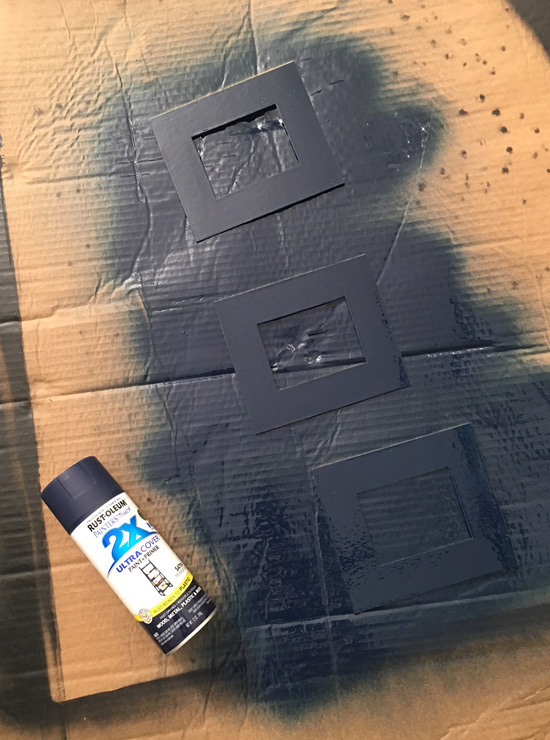 Once again…paint to the rescue! I figured it would be easier to knock them both out at the same time. 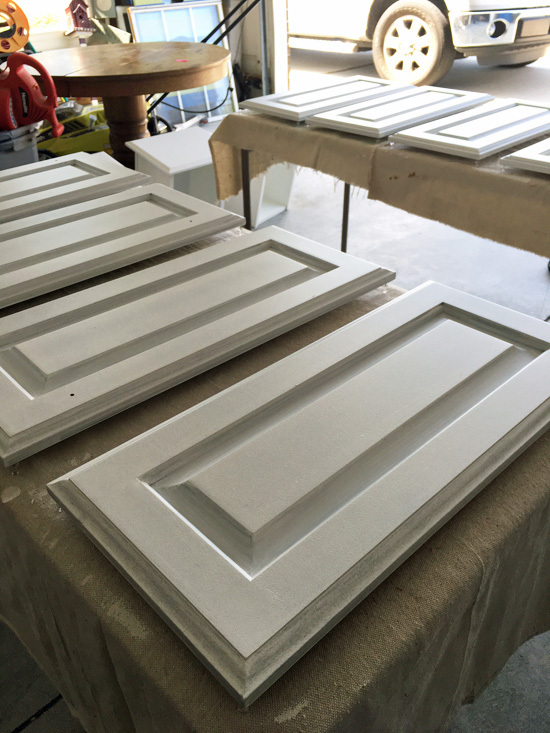 I used Behr’s Ultra Pure White in a satin finish for both vanities. 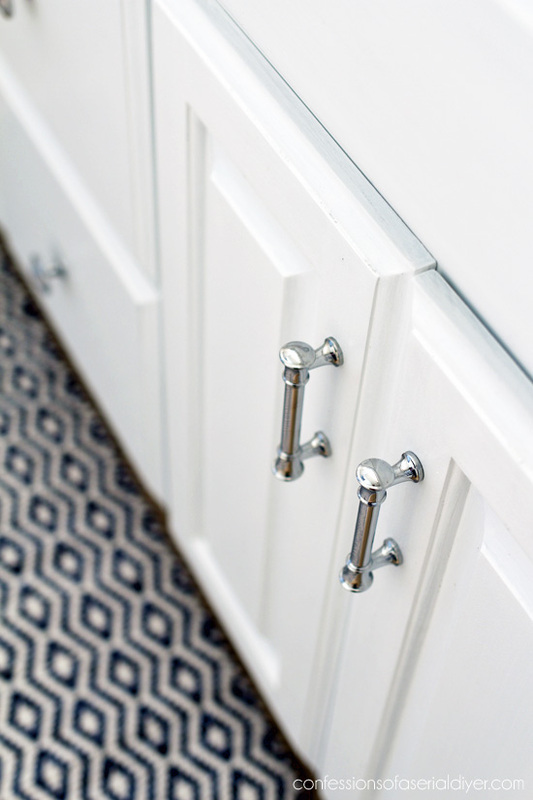 I love how clean and fresh the white cabinets look compared to the dark cherry stained ones. To paint this room, I started with the top third of the wall since I had plans to add board and batten in here. I just marked how high my battens would come and painted down to that point. The color I chose was Wind Speed by Behr in a satin finish. Then I painted the bottom of the wall and the trim in Ultra Pure White by Behr in a satin finish to match the cabinets. 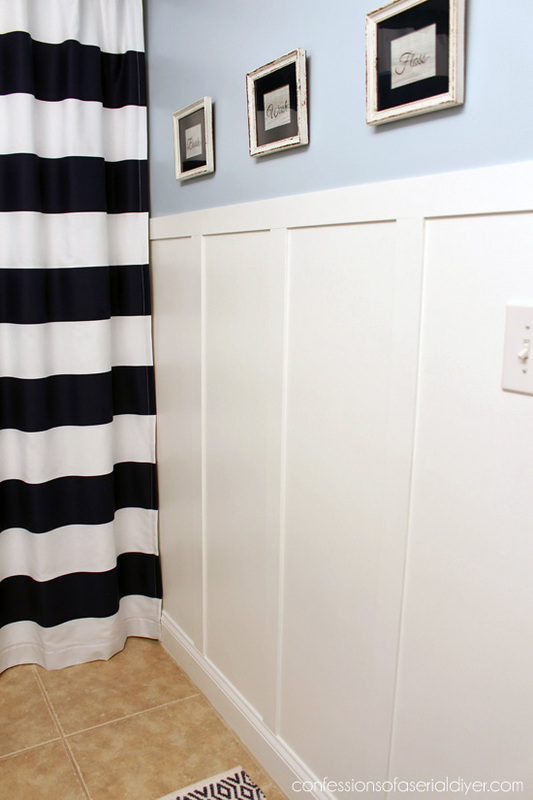 I painted these flat poplar slats that I found at Lowes to act as the “batten”. 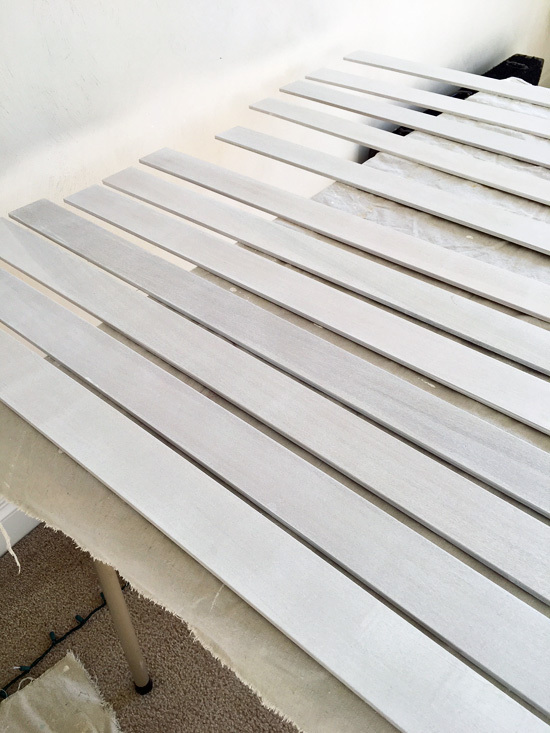 I cut the tips off so the cuts would be super smooth, then lightly sanded them, and painted them with one coat of primer and two coats of paint before attaching them to the walls. To decide how far apart I wanted them, I measured the longest wall and divided it into four even sections. That made my battens about 15″ from the center of each to the center of the next. I attached them with my nail gun. (I have this one HERE and love it!) Then I added the piece across the top, cutting with my miter saw where necessary. I followed up with caulk everywhere the batten met the wall to fill any gaps. 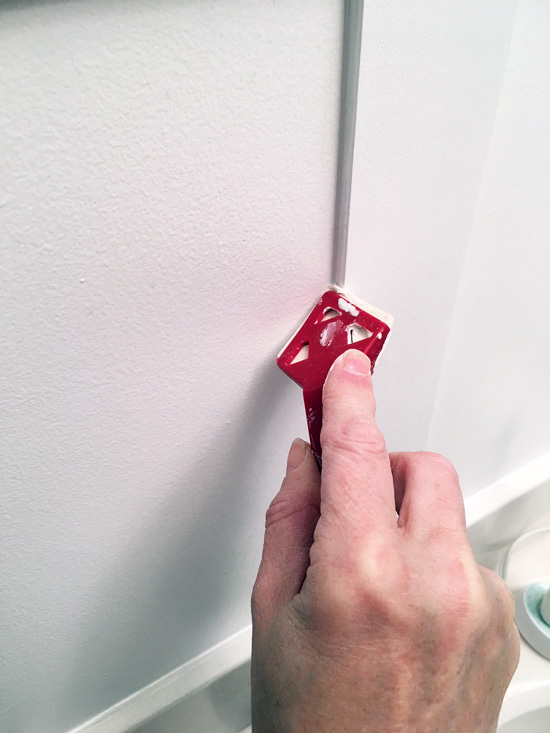 This $6 tool is THE BEST for getting smooth caulk seams every time! It comes with a caulk removal tool which isn’t great, but this tool is awesome! Works better than your finger, I promise! 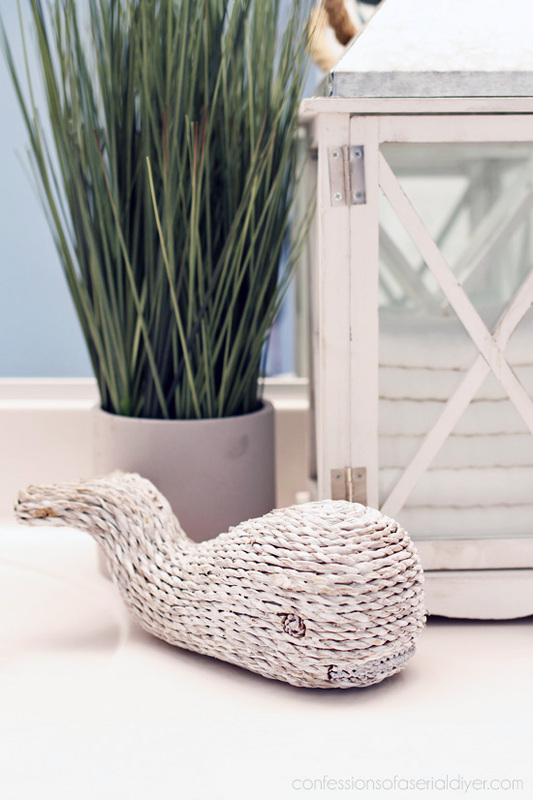 I love the coastal feel this gives this bathroom now. 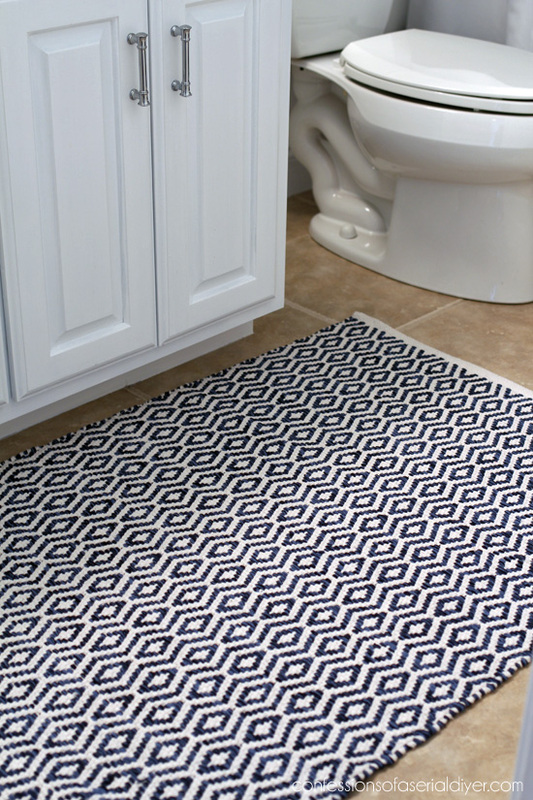 This was an easy fix to make them work for this bathroom. I tend to collect and make over things over time to decorate my rooms, but I had a hard time finding things that would come across as more masculine. So I decided a little shopping was in order. I found the grass plant in the outdoor décor section at Target. It feels coastal to me in this space. And I found the lantern with the rope handle and the sweet whale at TJMaxx. 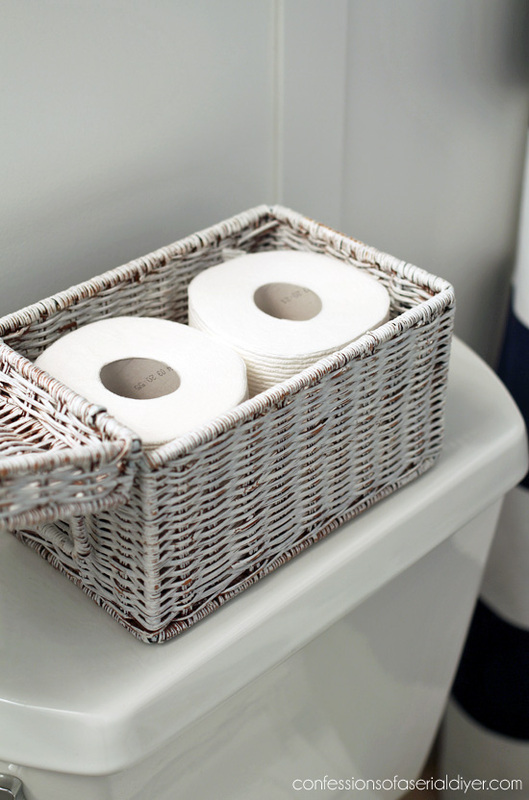 A lantern is a great place to store extra washcloths! 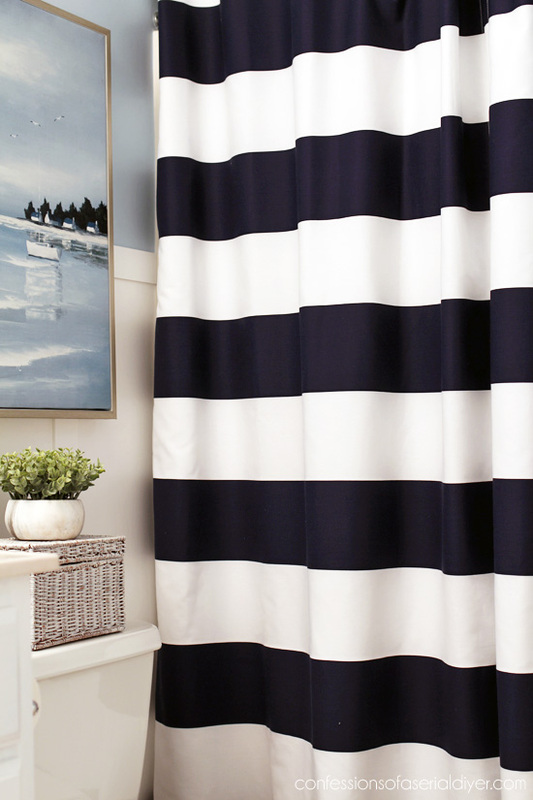 Jack originally picked out a navy and white striped shower curtain when we first moved in, but it ended up being too short. I like how much taller these are than a standard shower curtain would have been. The picture above the toilet also came from HomeGoods. This was one of the first things I bought for this space back in September, and it is also where I pulled the wall color from. It worked perfectly in here to hide a couple of spare rolls of TP. 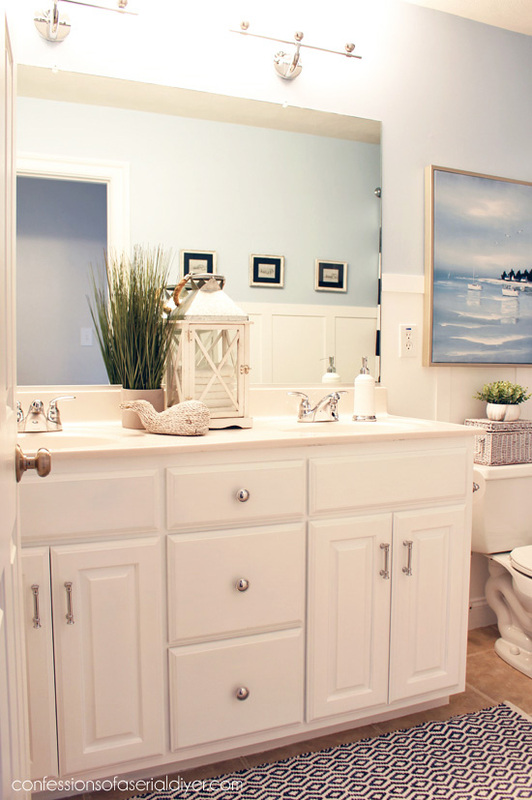 I love how light and bright this bathroom is now! There aren’t any other rooms that I’m in a hurry to finish now. Our kitchen will probably be next on the list, but that probably won’t happen until late Spring/Summer! UPDATE: See how I updated HERE now! Oh Christy…. BOOM!! You blew my mind! 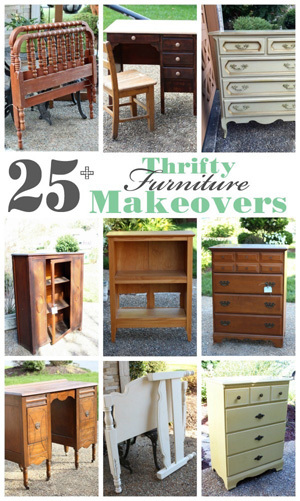 Ah-MAZ-ing makeover! 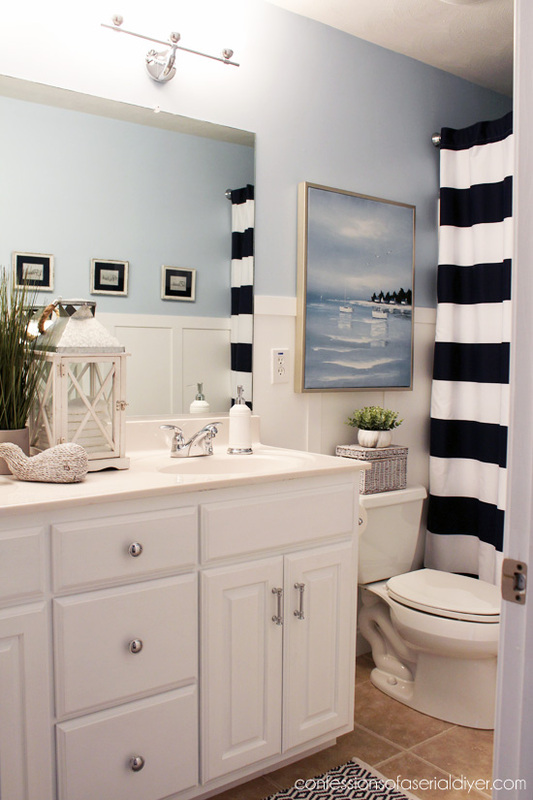 Love the paint, the curtains for the tub, the jewelry on the cabinets and even the board and batten which I usually do not care for. 🙂 Go you! I am betting the boys really enjoy their bathroom. That was a LOT of work and the payoff is wonderful!! Who would think of washcloths in the lantern?! You’re so clever! 🙂 I love this bathroom, you did a wonderful job! 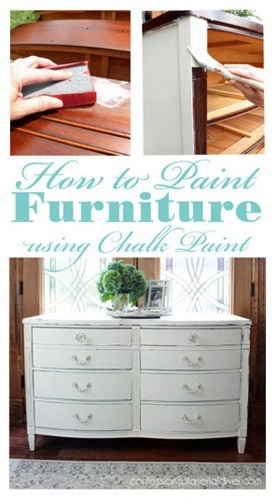 Thanks for the tip about that caulking tool – fabulous! 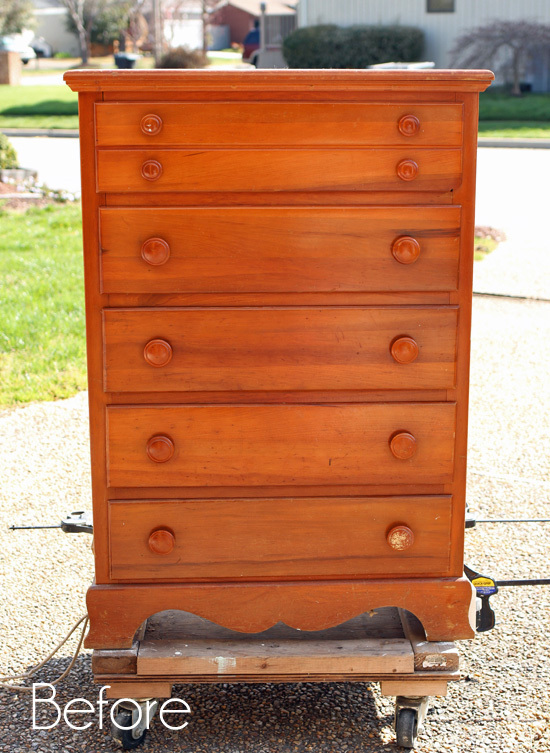 What a Beautiful make-over and I especially like your choice of the new knobs and handles. Lantern for extra washcloths; Pure Genius. Is the ceiling same color as the cabinets. Looks more of an off white. 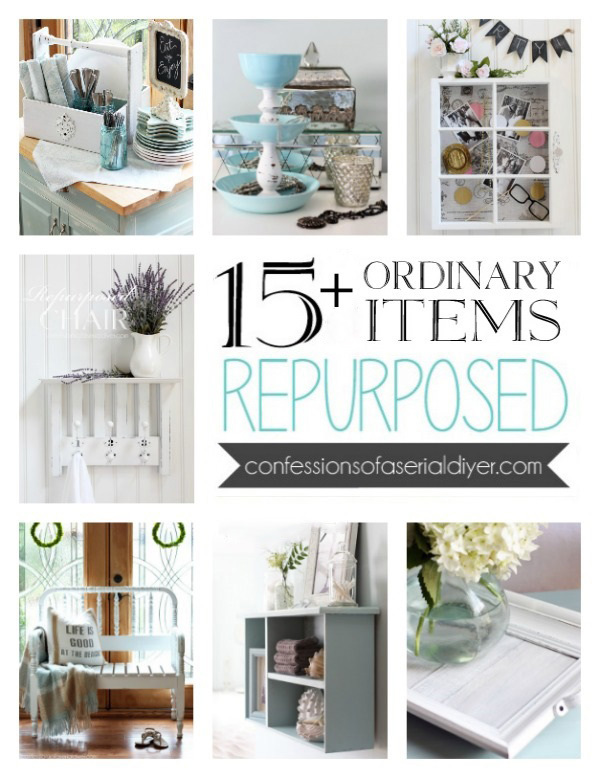 You have given me some great ideas when it comes time for me to redo our baths. Put first; I have to remove them darn popcorn ceilings that I absolutely hate and not looking forward to it one bit. Well for one the popcorn ceiling was cheaper to put on; no taping the dry wall seams and then having to paint All they had to do was get the sprayer and spray on that textured ceiling crap. True! We had it all over our old house! Everything looks great! I’ve been thinking about putting board and batten somewhere in my house so this really helps. What a lovely bathroom! Everyone usually hurries to cover the standard unframed mirror, but you didn’t and I actually like that it gives it that fresh and open appeal. Love it! What a remarkable transformation! 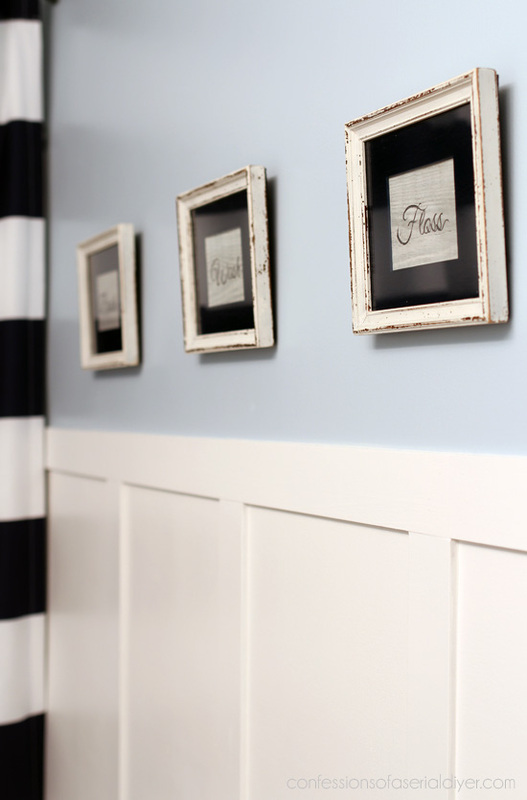 We have board and batten in our kids room too! 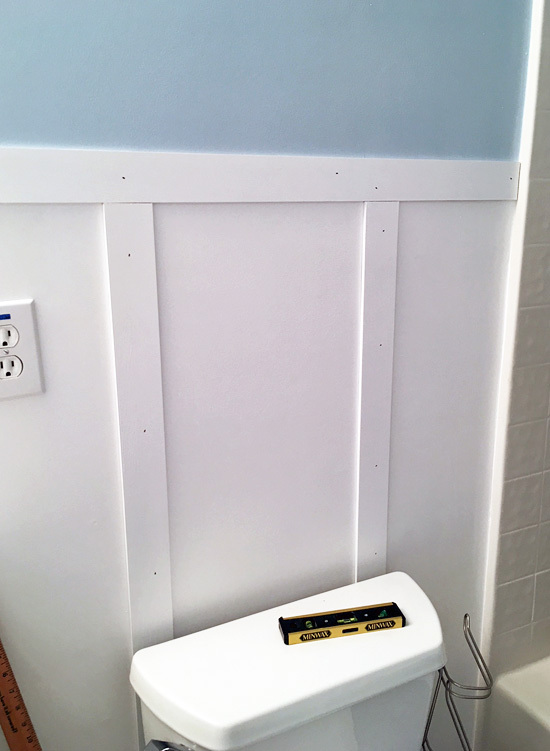 We added cleats to the vertical boards for hanging towels. OMG How beautiful! 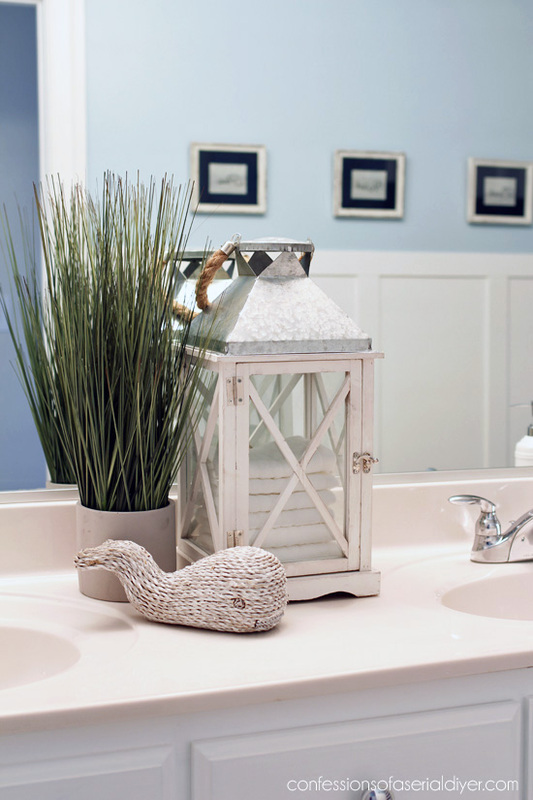 I love the use of the lantern for storing extra wash cloths. The painting is beautiful. I love the use of curtains as a shower curtain. Once again you have inspired me! Soooo pretty! 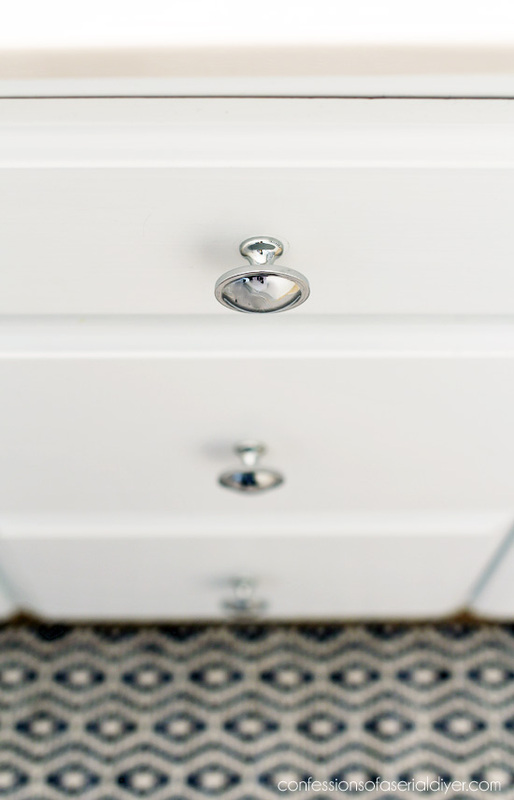 Love the mix of hardware, great tips on painting, and the lantern for storing extra wash clothes! Genius!!! 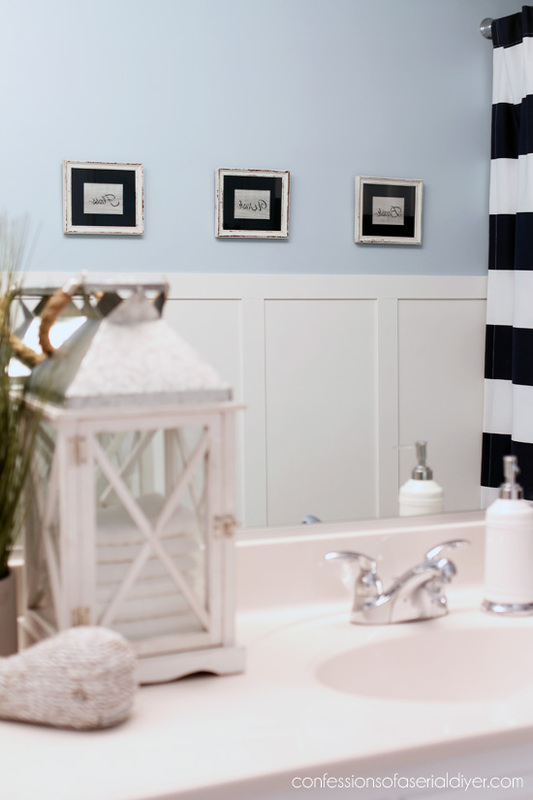 You truly did an outstanding job on everything in this little bath. 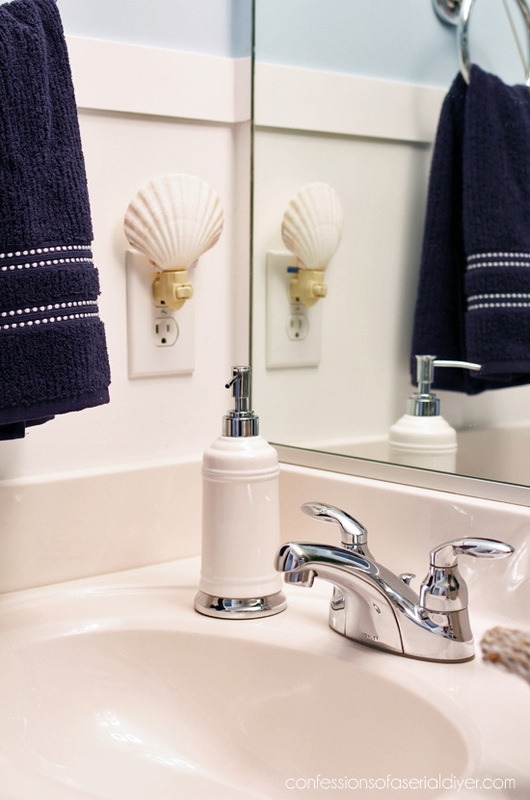 Where do you hang towels? Hi Marianne! I mentioned that I had bought hooks to hang along the wall of board and batten, but in the end I thought it might close the space in too much. 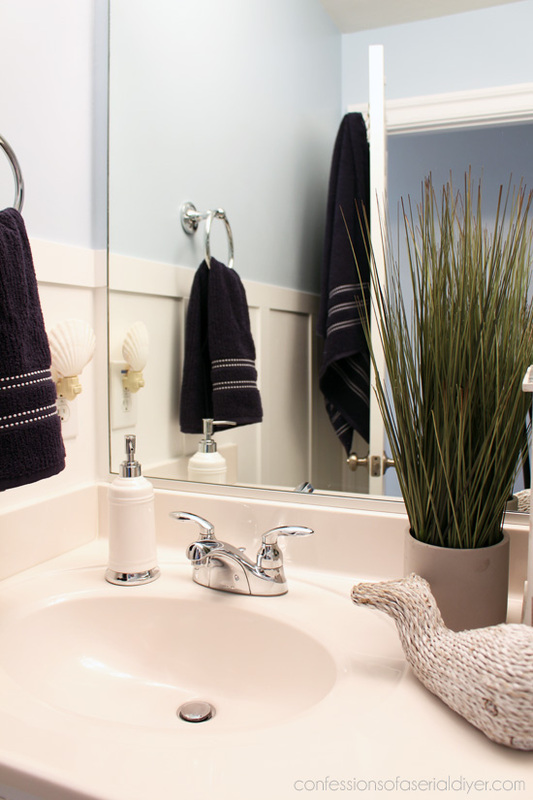 So to hang the boys’ towels, I am using the same over the door towel rack that we have used for the past several years, since that has worked well for them. Looks beautiful! Did you actually cut apart two solid curtain panels and sew the strips together? I love your innovation to make exactly what suits your tastes. Did you do anything to the floor tile? 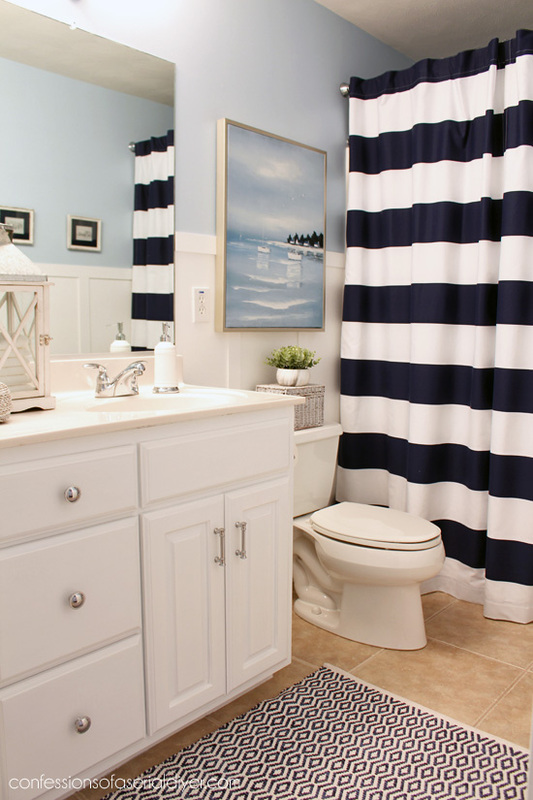 Stunning bathroom Christy…you are such an inspiration! Did you sew the 2 curtain panels together? You painted the mat to match?! This is why I have you. To fix a problem I’m having. Today, it’s having pink mats that I hate and needing to change them. NEVER would’ve thought to paint them. 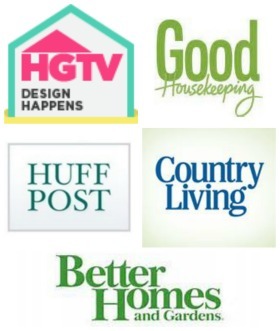 Maybe I’m not DIY enough…. Very, vvery nice!! The crisp blue/white theme is perfect for boys! Well done! This bathroom makeover is just what I needed to see as I begin redoing a powder room. Your step by step guidance is a lifesaver for me! Thank you! WOW! And I am in love with the lantern holding washcloths! U R A genious. 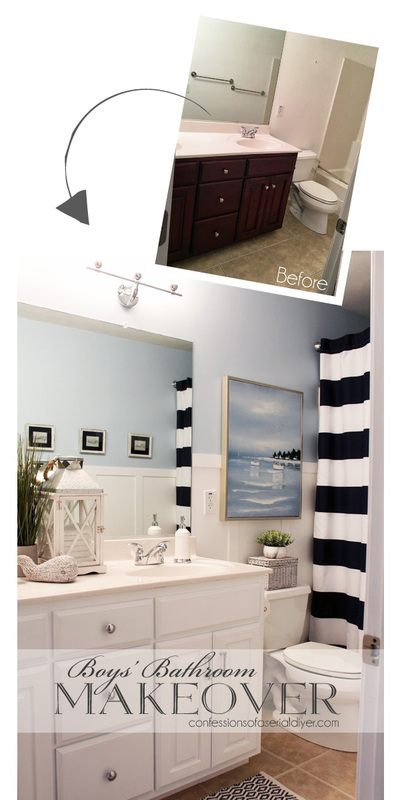 That bathroom went from blah, to BEAUTIFUL! A lot of great details. A job well done! I luv the splashes of navy blue you added to the room. 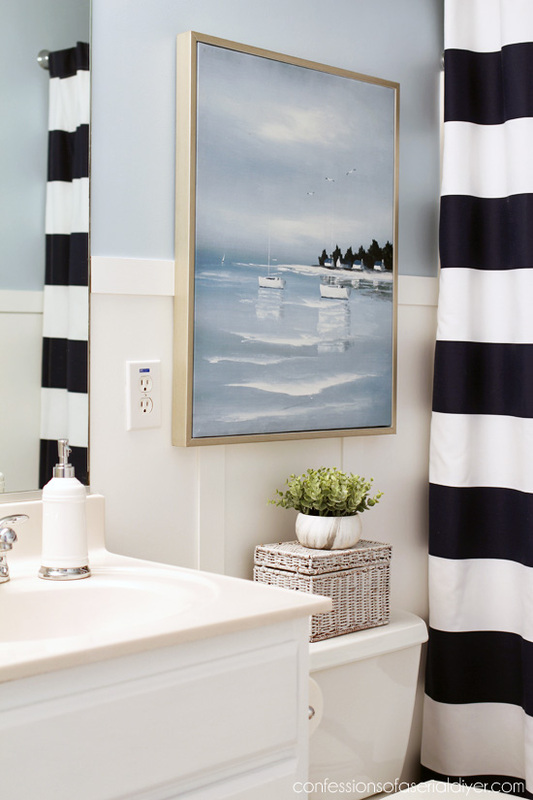 Now you have me rethinking our guest bath as a redo. Great ideas and style. What a fun space! I love every bit! Great use of the lantern! 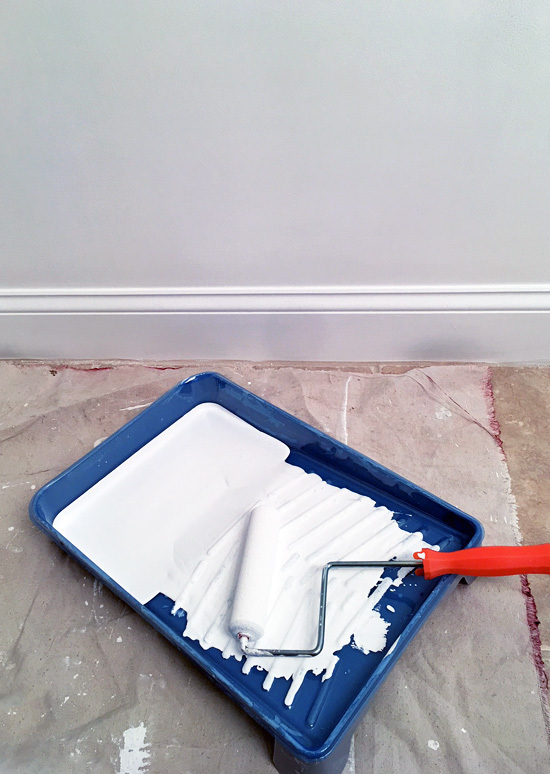 I now look forward to repainting my bathroom, cause I’m going to use a 6 inch roller this time! Thanks for the tip; I’m so glad you share with us. I love the way you hung the picture. I don’t think I would have ever thought of that. It works perfectly. And the way the waves (?) are right at the battens edge. Visually it is perfect. Beautiful makeover Christy 🙂 It’s so you! Wonderful make-over!!! YOU did it AGAIN!!! Always love all your make overs. Keep up the good work. 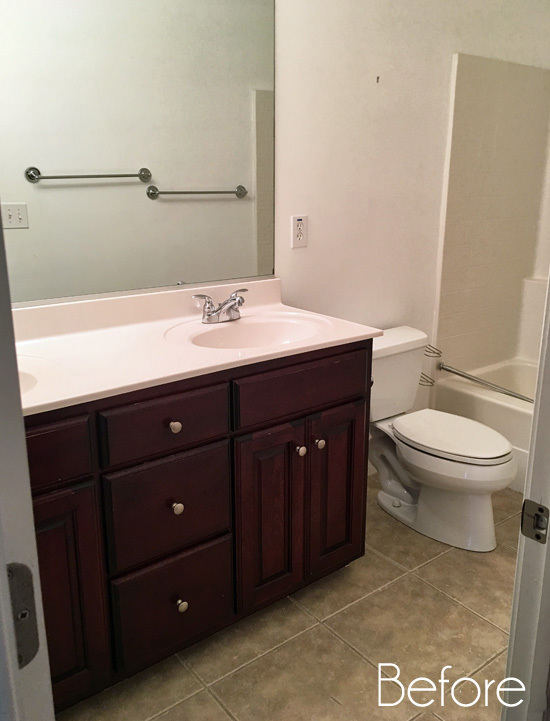 Why do they put those dark cabinets in bathrooms? Love a clean light look. Looks great Christy! Sounds to me like your son has an eye for decorating. He may be moving in on your territory soon! 😉 I made a trip to our local Goodwill today. It’s funny how one location has much more than another. Got a lot of great things and I can’t wait to get started. Can’t wait to see the rest of your house! Thanks again for your lovely creativity and inspiration…I don’t know how you do everything that you do!!! What a beautiful, coordinated, functional space! Your “storage lantern” is genius! Now to check on that caulking tool… Great job here! 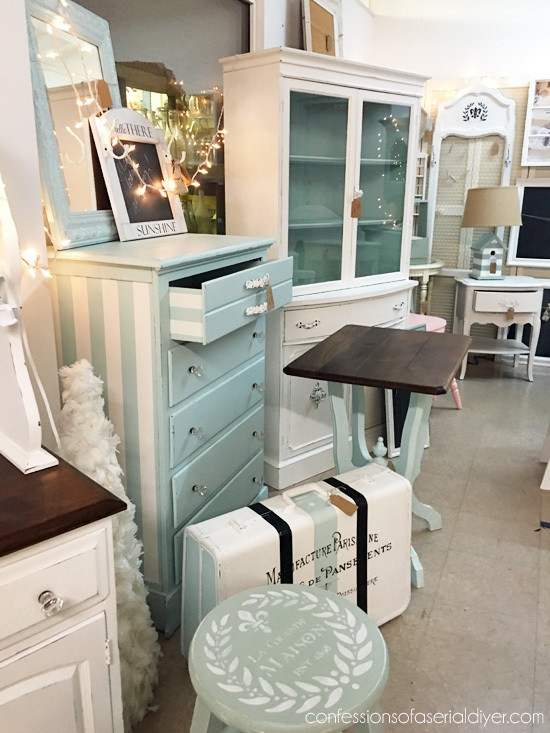 You definitely added some masculine personality to this room – what a difference between the before and after! 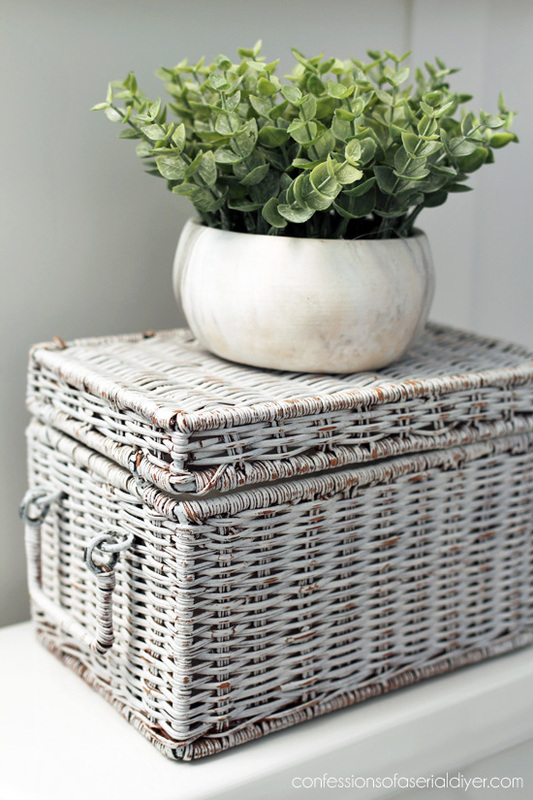 Love your lantern idea for facecloth storage too. 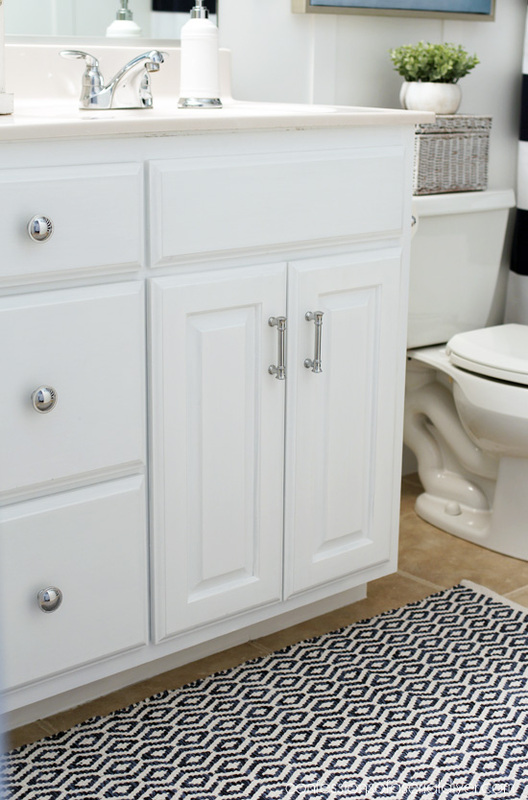 Great looking bathroom 🙂 Where did you get the knobs and handles, they are perfect for a bathroom I just re-did.